It’s been a crazy past few weeks in my life lately. Lots of ups and downs. Unexpected surprises. Anticipated downsides. Basically I feel like I’ve been living on a roller coaster lately. And I’m a lovely combination of being mentally, emotionally, spiritually, and physically exhausted. However even with all the crazy that is going on in my life, I still managed to find several silver linings. 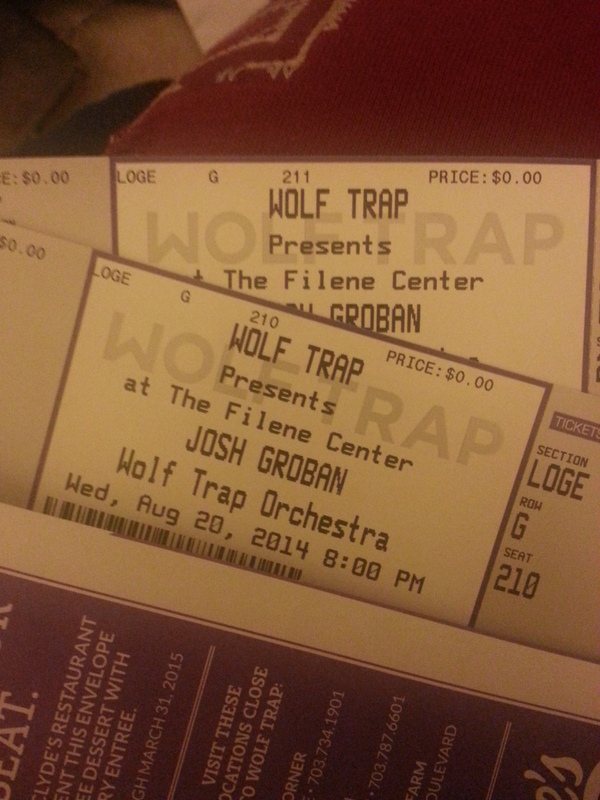 I woke up on Tuesday morning to the best news ever….I won tickets to see Josh Groban! There had been a contest from the venue’s location to name your favorite JG song and I entered with saying about how I hadn’t really listened to his music until this past year and yay for “False Alarms.” Didn’t think at all that I’d win. And then boom I did. The really awesome part was that I was totally expecting lawn seats because why would they give away seats that people would pay more money for? Then I got the tickets in the mail. These are actual seats! In the balcony! This is pretty frakking awesome! And yes, I did buy tickets to see him for the night before as well. I don’t need to defend myself at all. But right now, knowing that I’m going to have back to back nights of Josh Groban in my life is exactly what I need. Also he’ll be the host of (yet) another reality music competition show on TV this summer. So even if I don’t care about the music, I can have Josh Groban on my TV every week during the summer! The winning streak continued later that day because then I won a Twitter contest from Noodles and Company. Then on Wednesday, I got a text from Chick Fil-A saying I could get free chicken nuggets that day. Yay! Free lunch! While I was there, I received an email from my favorite movie theater telling me that as a rewards member I got the chance to be the first to RSVP for an advance screening of The Fault in Our Stars. Oh and that it was free as well. Free movie??? BOOM, I RSVPed immediately. And the RSVPs filled up fast so I was extremely lucky to get one when I did. I feel like I should feel bad because I haven’t read the book yet but you know what, I’m not going to. I’m really excited. I may write another post about how I seem to have good luck when winning contests. It appears that I do. On Thursday, I was FINALLY able to get my bridesmaid’s dress in as this has been a huge source of worry for the past few weeks. And the alterations are going to be a lot cheaper than I expected, so yay! Plus that day I found out I will be receiving for review from Amazon, a very nice set of pots and pans which makes me really excited because I love to cook and these will be awesome for that. Then this weekend was the bachelorette party for the wedding I’ll be in. And it was rather awesome. Spending time with some of my best girl friends was exactly what I needed. I can also now take a breather from wedding duties as I had planned the shower and the bachelorette weekend and now I’m all good until the actual wedding next month. There’s still a lot of stuff going on in my life that I both need to figure out and also just turn over to God. But it’s really great to know that there are still good things in life that I can find joy in. What a fantastic streak for you!!!! So many good things happening to someone who deserved them and appreciated them. Thanks! It’s nice when you can catch a break sometimes.